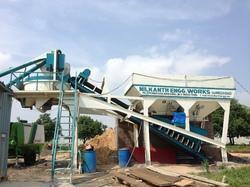 MOBILE CONCRETE BATCHING PLANT, MODEL NE-15 OUTPUT CAPACITY 15 M3/HR. Model NE-15 is a fully automatic, compact Mobile Concrete Batching Plant on heavy duty single chassis with two nos. wheel axles & towing bar. The towing arrangement in the plant facilitates it to be towed by tractor or equivalent power. The plant comprises of adequate capacity gravel & sand hoppers, weighing conveyor suspended on electronic load cells, reversible drum type mixer unit, cement silo with screw conveyor, rubber belt type charging conveyor, cement batcher, PLC based control panel. We are engaged in manufacture and supply of Concrete Batching Mixer that is constructed on rigid chassis made from heavy duty structural steel. It offers short cycle time and high uniform quality of concrete. It has pan type mixer with wear resistant replaceable linear plates on floor and side and for sand vibratory motor is fitted on one hopper. Cycle time id reduced with simultaneous dosing of gravel and cement. Control panel is based on PLC and offers 50 different recipes.